Which faucet goes with which sink? Which showering type is your customer? Which faucet goes with which modern ambience? 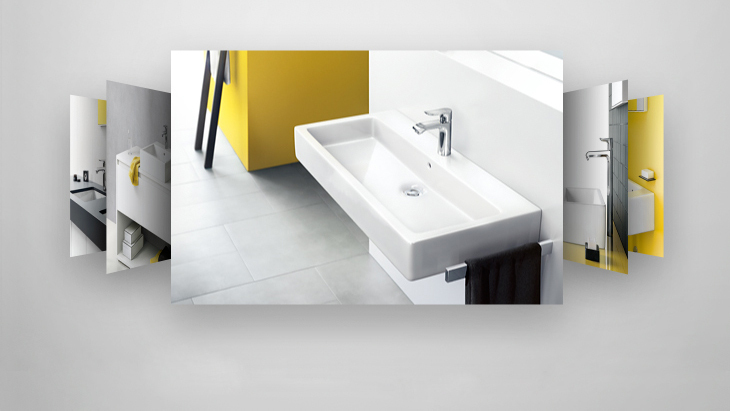 Design with simplistic shapes: What does the perfect combination of vanity and faucet look like? In conjunction with the right sink, Hansgrohe “Modern” style faucets are on top form, both aesthetically and in terms of functionality. Use the Hansgrohe recommendations, and help your customers put together the perfect duo: Ambience Configurator. Step 1: Select ambience. Step 2: Select faucet. See what all the models from the modern/simplistic Hansgrohe Metris, Talis and Focus faucet ranges look like on different vanities. The Configurator automatically gives you a selection of matching faucet types to choose from. So your customer can see which combination looks good and would be suitable for him/her right away. Use the Hansgrohe ambience recommendations to navigate visually. You can now use the practical online tool to show your customer how to gain extra space in the bathroom. This makes you more independent and more creative in your consulting and planning work. Check out the best possible faucet/sink combinations using all three style worlds: “Avantgarde”, “Modern” and “Classic”.